As an established customer you also have access to your invoiced orders. Click on “Invoices” to view these. 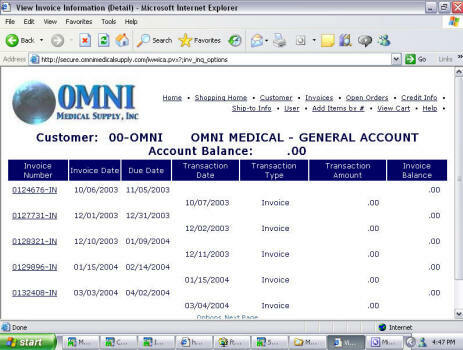 You are able to view invoice dates, due dates, and dollar amounts. The summary of all invoices will initially appear but you can select “options” from the bottom and you will then be presented with choices to filter the invoices by; including invoice number and date. You can select the invoice number to see detail of the invoice. To add all items from this invoice to your current order, select “Add all items to shopping cart”.